When running 12V electronic devices from lead-acid battery banks, the voltage to the appliance can vary from below 11V with discharged batteries, to well above 14V during charging. Many appliances will not tolerate such a wide fluctuation and may perform poorly or be damaged. This step-up inverter, combined with a 12V fixed regulator, is a good solution. Q1 & Q2, together with the ferrite pot-core transformer, comprise a DC-to-AC inverter. The turns ratio steps down the input voltage by about 30%. The square wave output voltage is rectified and added to the input DC voltage. The stepped up DC is then fed to a 7812 12V regulator (REG1). The specified regulator will supply 1.5A at 12V out, from any input into the inverter between 9V and 15V, with the inverter making up the shortfall. Current requirements are kept to a minimum by not having the inverter supplying the total current. By substituting a higher rated linear regulator, up to 5A can easily be supplied by this simple circuit. The transistors can be almost any general-purpose power type while the twin diode (D4/D5) is a high-speed device commonly found in defunct computer power supplies. Normal rectifier diodes can be used with a slight decrease in efficiency. The same comment applies to D2/D3. D6 is a protection diode and any 3A type will be suitable. By slightly modifying the turns ratio, and substituting the linear regulator, 24V devices can be operated from a 12V supply. Laptops requiring around 18V can be powered as well. 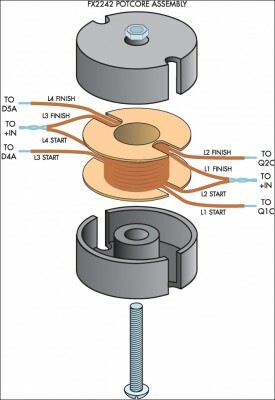 This diagram shows how to wind the transformer. L1 & L2 are six turns bifilar wound using 1mm-diameter enameled copper wire, while L3 & L4 are four turns bifilar wound.